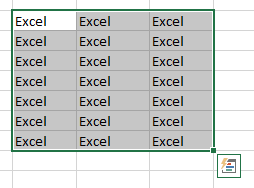 What is an active cell in Excel? How to make a cell active in Excel? Can more than one cell work as an active cell at the same time? You will get all of these queries answered in this article. The active cell is also referred to as cell pointer or selected cell. An active cell refers to a cell in Excel spreadsheet that is currently selected by clicking mouse pointer or keyboard keys. Remember only one cell can be an active cell at a time. An active cell is bounded by a heavy border around it. The intersection of a row and a column is a single cell. 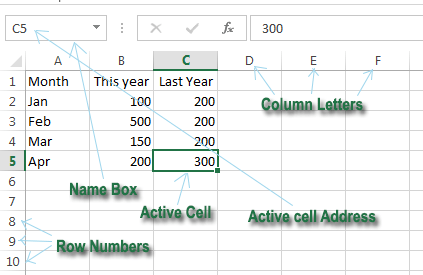 Each cell in Excel has a unique address made up of its column letter and row number. For example, the address of the first cell is A1. Remember column letter will come first and row number will be placed second in a cell’s address. An Excel 2013 spreadsheet is made up of more than 17 billion cells. 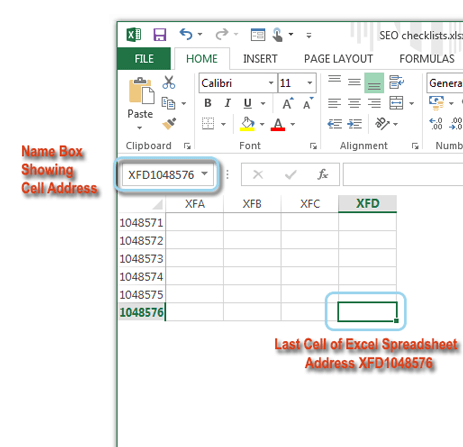 The address of the last cell in an excel spreadsheet is XFD1048576. Column Letters, Row Numbers, Active Cell, Active Cell Address, Name Box. Here the active cell address is C5. Find the last row with this command: End ⇒Down Arrow (↓), then find the last column with this command: End ⇒Right Arrow (⇒), you will reach the last cell of your Excel 2013 worksheet. You can choose the data type for your active cell. Just right click your mouse on your active cell and a pop-up shortcut menu will be visible with appropriate commands for the selected cell. From the shortcut menu, you can select any command appropriate for your active cell. You can format your active cell. 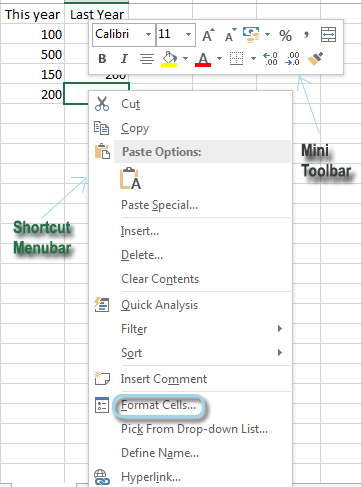 Just right-click on the active cell and select desired commands from the Mini Toolbar and Shortcut Menu. You can also format the appearance of an active cell. To do this, select ‘Format Cells…’ from the Shortcut Menu and you will get a dialog box from where select different functionality. When you click on ‘Format cells…’ option from the Shortcut Menu, this dialog box appears. Generally, a spreadsheet only has one active cell at a time. You can also select multiple cells if necessary. Just drag your cursor over a group of cells, that group of cells will be selected as active cells. Enter something from your keyboard, the first cell of the group will take the input, not all. If you press then CTRL+ENTER, all the cells in the group will take the values. Drag your cursor over a group of cells, that group of cells will be selected as active cells. Enter something from your keyboard and press CTRL+ENTER, you will get this type of output. While multiple cells are selected and if you change the format of the cell, then the changes will affect all of the active cells selected. 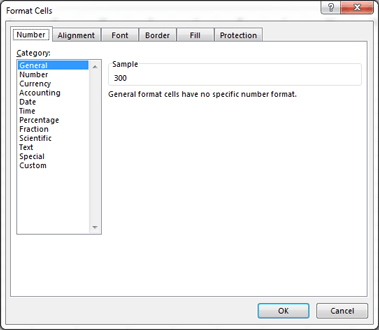 NOTE: When you will write functions for Microsoft Excel, the ActiveCell property is used to refer to the active cell. For example, you can use the following code to change the font of your active cell. Write some numbers in a cell and make it an active cell. Then just go Developer⇒Visual Basic, and a new Microsoft Visual Basic for applications window will display, then go Insert⇒Module, and then input the following codes in the module. After inputting the above code, click F5 on your keyboard to execute the code. You will find that the numbers in the active cell have been changed to bold and italic. By default, when you press Enter key on your keyboard, active cell will move one cell down. You can change this behavior by changing the option. Go to File, then Options, then select Advanced and in Advanced you will find ‘After pressing Enter, move selection’ checkbox. Choose the first value of the Direction drop-down menu, you will get the other three options. So, these are all about the active cell in excel. If you have any question related to Excel Active Cell, please put it in the comments section.